Mit 66 immer noch 13. French sailor Armel Le Cléac’h today won the Vendée Globe in one of the most thrilling finishes the solo round the world race has ever seen. 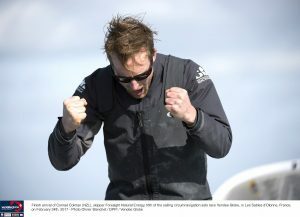 After 74 days and almost 24,500 nautical miles of first-class ocean racing Le Cléac’h was finally crowned victor in the long-running battle with British skipper Alex Thomson for the top spot in the solo round the world race, regarded as one of the toughest sporting challenges known to man. 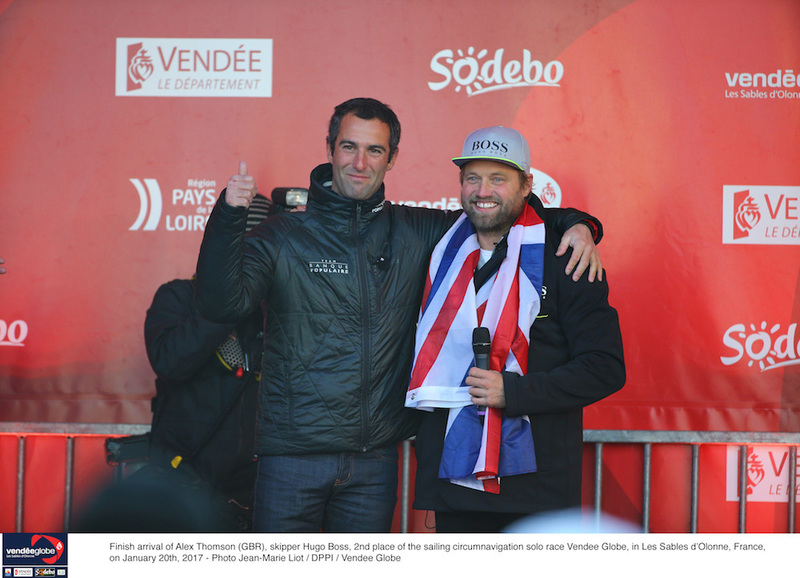 Le Cléac’h, 39, from Brittany, sealed the win – and a place in the Vendée Globe history books – crossing the finish line at 1537 UTC to complete the course in 74 days, three hours and 35 minutes. His time sets a new record for the race, beating the previous record of 78 days 2 hours 16 minutes set by French sailor François Gabart in the 2012-13 edition by three days, 22 hours and 41 minutes. 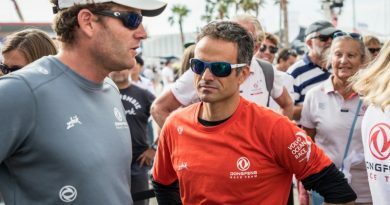 Dozens of spectator boats took to the water to welcome their new hero back to the French port of Les Sables d’Olonne, from where the race started on November 6 last year. 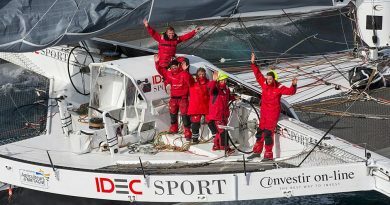 With his shore crew taking control of his 60ft IMOCA race boat Banque Populaire VIII, a tearful Le Cléac’h was left to enjoy an emotional reunion with his son Edgar, 6, and daughter Louise, 9. Thousands more fans lined the walls of the town’s famous harbour entrance as Le Cléac’h arrived dockside at Port Olona to a fanfare of fireworks. 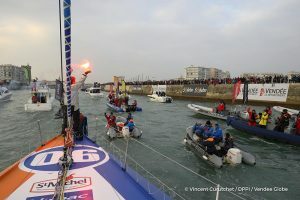 Le Cléac’h took the lead within 24 hours of the race start but had lost it to Thomson by the time the skippers, both racing on new-generation foiling IMOCA 60s, reached the Equator. 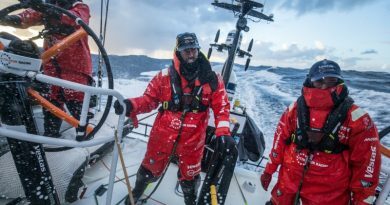 After catching Thomson in the Southern Ocean the pair traded places on numerous occasions before Le Cléac’h established a solid lead on December 3. From that point on he refused to relinquish his grip on first place despite a sensational effort from Thomson to reduce an 819nm deficit at Cape Horn to just 50 miles at the Equator. Even when Thomson surged to within 30 miles of Le Cléac’h with a few hundred miles to go the French sailor held strong, defending his position until victory was all but guaranteed. Le Cléac’h averaged an incredible 15.43 knots of boat speed over the 27,455 miles he actually sailed, on occasion hitting speeds in excess of 30 knots. 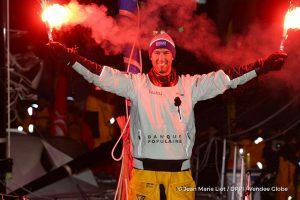 His best 24-hour run came on January 16 when Banque Populaire covered 524.11nm averaging 21.8 knots, surpassed only by Thomson who on the same day sailed 536.81nm averaging 22.4 knots, breaking François Gabart’s existing record by two miles. Le Cléac’h held the top spot for 56 of his 74 days at sea, and between him and Thomson they broke every single one of the existing race records. 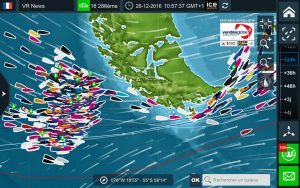 The Vendée Globe is going down to the wire with the leading pair of Armel Le Cléac’h and Alex Thomson split by just 78 miles as they enter the final 1,000 miles to the finish. Thomson has been playing catch-up since Le Cléac’h took the lead on December 2 but as the race enters its final few days he has transformed from the chaser into the hunter, ruthlessly stalking his French rival in the hope of being able to deliver the killer blow before the race is up. 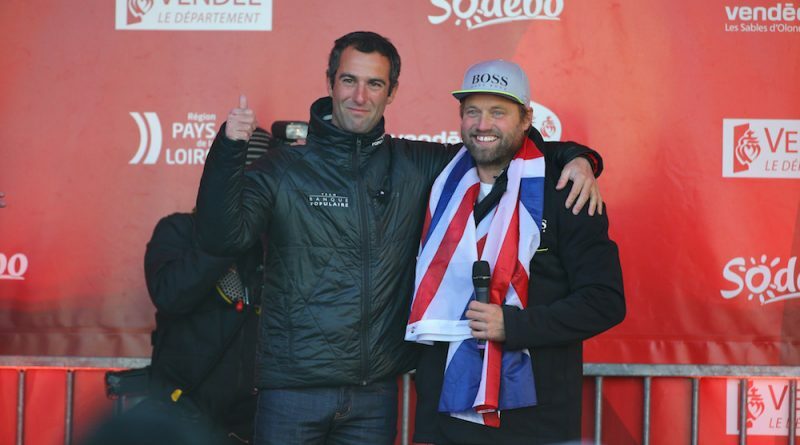 The British skipper delivered a timely warning to French skipper Le Cléac’h today when he smashed the world record for the greatest distance sailed solo in 24 hours. Hugo Boss skipper Thomson maintained a staggering average speed of 22.4 knots in the 24 hours leading up to the 0800 UTC position update to notch up 536.8nm. 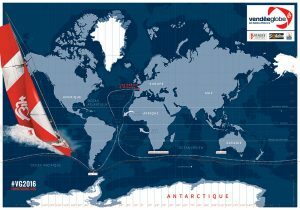 The distance breaks the 534.48nm record set by François Gabart in the 2012-13 Vendée Globe that he went on to win, beating Le Cléac’h by just three hours. In that respect the new record could be considered a good omen by Thomson, who is aiming to become the first Brit in the race’s 27-year history to win it. He actually beat Gabart’s record two weeks into the race, sailing 535.34nm in 24 hours, but the rules of the record state it must be superseded by one whole mile. Thomson previously held the record between 2003 and 2012 with a distance of 468.72nm. The new record will now be ratified by the World Sailing Speed Record Council. Banque Populaire skipper and pre-race favourite Le Cléac’h has hardly been easing off on his run into the finish. Over the same 24-hour period he covered 515 miles at an average of 21.5 knots. 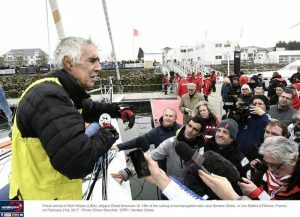 By the 1400 UTC report Le Cléac’h was matching Thomson’s 21 knots of boat speed with a slim buffer of 78 miles at the latitude of Cape Finisterre on the north-west point of Spain. 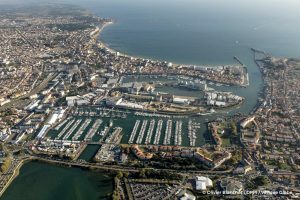 Rather than head for the finish line in the Vendée port of Les Sables d’Olonne the duo must continue north east to avoid the centre of an anticyclone currently blocking their path east. By tomorrow the winds and therefore boat speeds will have dropped, and several days of light-wind sailing lie ahead. 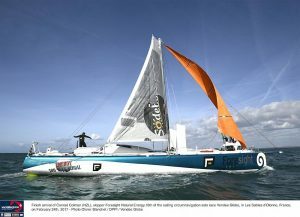 Both skippers are expected to finish on Thursday January 19, potentially just a few hours apart. Thomson was not the only skipper with cause for celebration today. Fabrice Amedeo in 11th and Arnaud Boissières in 12th both rounded Cape Horn, the southern tip of South America, to begin their ascent through the Atlantic to the finish line. Amedeo rounded at 0140 UTC with Boissières following suit just over four hours later. Thirteenth-placed Swiss sailor Alan Roura will be next round Cape Horn, adrift by just 30 miles at 1400 UTC. Rich Wilson in fourteenth still has 150nm to go. Meanwhile 65-year-old Dutch sailor Pieter Heerema passed Point Nemo, the most remote place on the planet more than 1,700 miles from inhabited land. 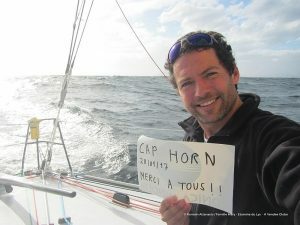 “Now I want to get around Cape Horn as quickly as possible,” he said. “It’s a really key landmark. We’re now 70 days into this race and there’s still a long way to go. I’m enjoying it but I’ve also more or less had enough.